When the temperature drops outside, thoughts of going for a run or making a trip to the gym in the cold can be unappealing, to say the least. 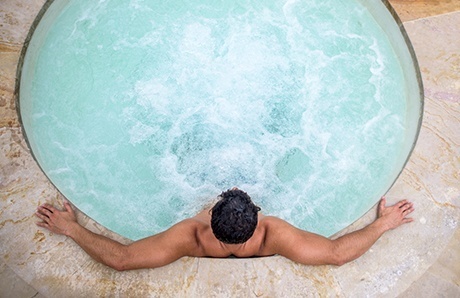 Rather than break your good regimen, consider taking your workout to the closest hot tub, inground spa—or a heated whirlpool or hydrotherapy pool that may be available at your gym or housing complex. Whether at home or at a public facility, the warm bubbling water is ideal for both exercise and hydrotherapy—even when it’s cold outside. You can do a variety of moves that work your muscles and get your heart rate up. Afterward, you can give your muscles and joints some “liquid therapy” with the massaging action from the spa or hot-tub jets. At first blush, this kind of workout may not seem much of a challenge or as effective as a hard jog in the cold, but it offers many benefits. In fact, in some ways, it may be even better for your body than a conventional gym routine. Let’s look at some of the benefits of hydrotherapy and exercise in warm water for improving your health, fitness, and recovery during cold winter months (or whenever the mercury outdoors dips to uncomfortable levels). One category of exercise is weight-bearing, which involves resistance on your muscles. In this regard, aquatic fitness offers unique advantages. It comes down to hydrostatic pressure: the constant weight or force that water places on your body when you are partially or fully submerged. Where an exercise machine or free weight might exert resistance on muscles in only one direction, being in water means your body will experience equal pressure from all angles. Think of hydrostatic pressure in a heated spa, hot tub, or whirlpool as a “wet blanket” that does your body good—a warm, comfortable, compression system that runs from your neck down to your toes. In cold weather, you may see people exercising outdoors while wearing layers of clothes—particularly compression gear and leggings—to stay warm and healthy. In a spa, hot tub, or whirlpool, the warm water provides all the same benefits, but without expensive tights or having to bundle up. Beyond how comfortable warm water feels, its resistance on your body can boost your cardio workout. This gentle, consistent resistance makes your heart and lungs work just a little bit harder. Upon inhaling, your lungs expand and fill with air; if your chest has to push against water, doing so is slightly more difficult. By spending time immersed in warm water doing—even with your head above it—you’ll be strengthening your lungs simply from the extra energy required to breathe and move. Do a series of cardio moves with your arms and legs and you can burn even more extra calories. The second benefit of exercising in warm water and enjoying hydrotherapy: enhanced circulation and the results it delivers. Warm water dilates—opens wider—blood vessels so that blood can flow more easily around your body. On the other hand, cold air and water temperatures can decrease blood mobility by constricting the vessels. Do you know a how a cold, stiff garden hose doesn’t work quite as well when in frigid temperatures, and the hose constricts on itself? Your blood vessels work the same way. Heat’s ability to boost circulation is why we often see warm compresses applied to mild injuries; heat helps blood circulate more easily into the area to support the healing process. From a health and fitness perspective, there are several reasons why good circulation is important. Blood is your body’s transport system, carrying oxygen and nutrients to all parts of your body. Now, during exercise, you want to move oxygen around as efficiently as possible. When you do, you can train harder and longer. That’s why using a heated spa, hot tub, or whirlpool as your gym setting makes exercising a bit easier when it’s cold out. The goal of exercise is to improve fitness and health levels. The best results come from pushing your body close to its limits, recovering, and then trying to do just a little bit more the next time. Challening ourselves is how we improve over time. To continue making progress, it helps to minimize muscle pain by exercising safely. After all, you won’t get very far if you are constantly hurting yourself. A warm environment allows you to exercise much more efficiently during the winter months. Before any resistance-type workout, properly warming-up first can slash the odds for injury. Hot yoga studios aside, other than nice toasty spa or hot tub, what setting can warm you up so quickly—and without requiring extra work? Muscles are elastic; think of them as rubber bands. If you get that elastic band nice and warm, and gradually stretch it and move it around, it should hold up just fine. However, if you take a cold, stiff rubber band, and aggressively stretch it, you risk tearing or breaking it completely. Certainly, that outcome isn't something you want for your muscles! In addition, warm water helps protect joints by allowing them to move more freely. While some joints have greater inherent mobility, others are less fortunate. Heat can help here. When warmed up, adjacent muscles and tendons relax as more blood rushes into them, improving the joint’s range of motion. The effect is similar to a support or compression sleeve for knees or elbows, but better: The positive impacts happens to all of your joints simultaneously when you’re in warm water. Along with preventing some of the typical post-workout joint and muscle soreness, exercising in heated water provides other payoffs for your workout. It helps sooth minor pains you may have from either a land-based exercise or other chronic health conditions. For example, if you suffer from neck or low back pain from working at a desk all day, try stepping in a heated spa or hot tub for a while. The same goes for mild elbow pain, achy knees, or other spots that you find sore and stiff. For many people with ailments like arthritis, relaxing in the warm swirling water and pulsating spa jets can bring some much-needed relief. The heat and buoyant environment are particularly beneficial if you suffer from chronic low back pain or neck stiffness, which many adults do from working all day at a computer. You could go to the gym with a heating pad taped to your back, sure, or you could just make a warm spa your gym and save yourself the trouble. The heat will help relax those muscles and bring fresh blood and nutrients to your neck and back—areas which are otherwise hard to stretch and relax. If you find regular exercise difficult due to low back or neck pain or other mobility challenges, try working your muscles with exercises designed for the spa or hot tub, and you’ll probably find them much more bearable—even comfortable and enjoyable. Finally, warm hydrotherapy may help you catch more z’s. Especially when you take a dip in a spa or hot tub shortly before bedtime, the effects can make a nice difference when you hit the sack. There are several reasons why. First, the warm water increases blood flow to all parts of the body. As a result, a little bit of the blood supply from your head gets diverted to the rest of your body, causing your brain to slow down. Increased blood flow and warmth to muscles can also help your entire body relax and decompress, relieving tension. If you’re stressed or have anxious thoughts, a hot soak may be just the thing you need to help turn down the chatter in your mind. When you submerge in warm water, your body temperature also slightly rises as you adjust. After a while, it levels off and begins to drop again, which mimics the natural process of what happens as you fall asleep. So, before you hit the hot water at the very end of your day, be ready for bed. Finish your evening routine—remove your makeup, moisturize, brush your teeth, check on the kids—and keep a fresh towel nearby. After a hot soak, you’ll be so relaxed and sleepy that you’ll want to dry off and crawl into bed as quickly as you can! As tempting as it can be to hibernate and use the low thermometer reading as an excuse to skip your workout, don’t: Keep moving. It’s important to get regular activity to stay healthy and reduce any unnecessary weight gain that sometimes creeps in during the cold weather and the holiday season. It doesn’t hurt that a spa or hot tub also provides a warm, comforting break from the cold weather and keeps you feeling warm and cozy while working your body. Do take care to take extra steps to safely use your spa or hot tub when it’s cold outside. If working out in the cold isn’t your cup of tea, then a warm aquatic workout and accompanying hydrotherapy offer the perfect solution. You’ll be comfortable as you exercise, and your body will thank you!